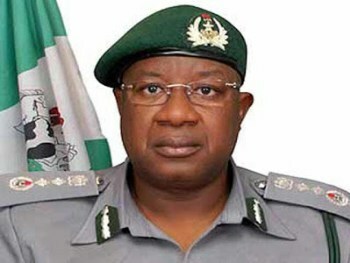 Immediate past Comptroller General of the Nigeria Customs Service, Abdullahi Inde Dikko, is being detained by the Economic and Financial Crimes Commission (EFCC) over an alleged N42 billion fraud committed while he was in office. The former Customs chief is also being investigated for N2.6 billion which he allegedly used to purchase a mansion at 1, Audu Ogbe Street, Jabi, Abuja. “The former Customs boss is at the moment being quizzed over two key allegations bordering on criminal conspiracy, diversion of public funds, theft, abuse of office and living above legitimate means. He is being grilled over the source of the funds with which he acquired the palatial mansion valued at over N2billion located at 1, Audu Ogbe Street, Jabi Abuja. There is also an allegation that he diverted over N40billion from Customs coffers. The funds were allegedly drawn from proceeds of the 7% cost of collection and 1% comprehensive import supervision scheme. There are lots of questions that he has to answer. Discreet investigation has been going on for months and this is the opportunity for him to clear the air on the allegation and other evidence that have emerged in the course of investigation”. The EFCC operatives believes that Dikko’s Jabi mansion was funded largely through kickback from Customs contractors, the N100million spent to buy the land on which the mansion sits was provided by a Customs contractor. Ditto for the first tranche of N650m used in the construction of the gigantic building; and that the funds were allegedly paid to Dikko’s personal lawyer by the contractors. The Lawyer transferred the funds to the engineer handling the construction. Both the lawyer and the engineer allegedly admitted their roles, claiming that they acted on the instruction of the former CG. EFCC operatives are also looking into how a former Assistant Comptroller General of Customs under Dikko allegedly got paid over N2.6billion, which was remitted into accounts of companies floated by the officer from the Customs’ coffers. In addition to the EFCC’s probe, a pressure group identified as the Nigerian Customs Transparency Initiative(NCTI) has petitioned the Independent Corrupt Practices and Other Related Offences Commission (ICPC) over alleged abuse of office, disappearance of some containers and the N3.5 billion incurred on the installation of Internet facility by the Customs Service. In the petition, which was signed by Dr. James Onoja, the NCTI said: “Purchase of vehicles: Prices of B.M.W vehicles for senior officers were criminally inflated. About N3.5 billion naira was siphoned and frittered away through an internet project that never saw daylight. Thirteen (13) containers at T.C.I.P. were impounded sometime ago. It was claimed that four Iranians were arrested with the containers, two of which disappeared into the thin air. There is false declaration of Annual Customs Revenue Generation. In order to give false impression of excellent performance, the Customs Service adds figure of the Value Added Tax (VAT) which Customs collects on behalf of Federal Inland Revenue Service (FIRS) to the revenue derived from custom duties whereas the same VAT figure has been included in the VAT revenue declared and announced by FIRS as required by law, thereby creating a misleading duplication of revenue figure derive from VAT.